Seanchai Library will be performing at AvatarFest this weekend. And of course doing our best to win new visitors for Kitely! The AvatarFest grid is up now to visit, and is Hypergrid enabled so you can visit directly from Kitely! We even have a gate set up at our Portal on Seanchai. 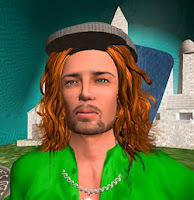 AvatarFest is the celebration of the strength and diversity of the hypergrid user community. "We do not represent corporations, companies nor grids – we are the customers, users, builders and dreamers who live out here, sharing our dreams and creations with one another." SO HOW DO I GET TO AVATARFEST ANYWAYS? Just go to Seanchai and walk through the Avatarfest Gate. We had a great turnout for the LAST OF THE WILD ONES storytelling at Avatarfest this morning! We were preceded by a memorial for the victims in the attacks in France. Very touching and good to bond with folks. AvatarFest is still going on with lots of cool exhibits and live entertainment. You can still get there now by visiting the Seanchai Library and walking through the hypergate to AvatarFest.